Snake Eyes has allied himself with Storm Shadow in an effort to bring down Cobra, starting with Zartan. But it becomes clear that each player has their own agenda. Chuck Dixon and Robert Atkins bring us the first chapter of "Serpent's Shadow" in Snake Eyes & Storm Shadow #13. I don't often find myself interested in Snake Eyes stories, but this recent story line has my attention. Dixon is giving us some good background on Snake Eyes, Storm Shadow, and Hard Master this issue, more than we've ever gotten before. As much as we've seen Snake Eyes and Storm Shadow before now, we still know very little about them or their respective histories. With brief flashback vignettes, we get a bit of history and a bit of personality. More intriguing, though, is the main plot. Rather than a simple team-up of former allies against a common enemy, it seems that every character has an agenda he or she is hiding from the others. Most surprisingly is Snake Eyes, who does not hesitate to wipe out his Red Ninja allies before starting his mission to take out Zartan. Rika, working under Storm Shadow, seems to have her own mission. And I suspect Storm Shadow himself is not being honest with his "brother." I appreciate stories in which I haven't the faintest idea what the next chapter will bring. This is one of those stories. While Storm Shadow has been an established character for a while in the IDW universe, there's still very little we know about him. His infiltration into The Pit shows he's a more than competent ninja, but for the most part, especially recently, he's been hiding within the shadows of the Red Ninja. We know he feels loyalty to his former oyabun, a greater loyalty than he feels towards Cobra. And we know he has respect for his former sword brother. And yet I feel there is much about him that is being intentionally hidden from us. 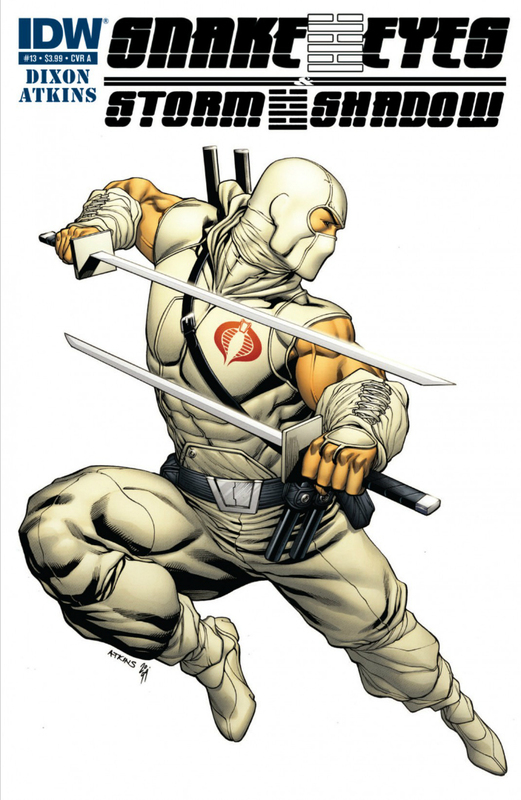 Storm Shadow appears to be the only character without a hidden agenda, but that does not mean he doesn't have one. His sudden, and surprising, decision to ally himself with Snake Eyes to take down Cobra makes me think there is much more going on than simple revenge. The IDW Joe titles have been characterized by art ranging from pretty good to outstanding, with most artists leaning towards the latter. Robert Atkins is a fan-favorite, a honor that is well-deserved. His clean, detailed, dynamic pictures speak thousands of words. The panel in which he surveys the bodies of the Red Ninja he just slain is a perfect example of what he does so well: a major, but subtle plot point is conveyed instantly, clearly, and beautifully. "Under other circumstances, [Zartan] might have made an excellent ninja." Thank you, Mr. Dixon, for not going down that path. An interesting plot that is getting more interesting with each passing issue. Recommended.